This home grown Japanese pumpkin (Kabocha) from Yim’s garden came in just in time for my Chinese style Halloween dish. 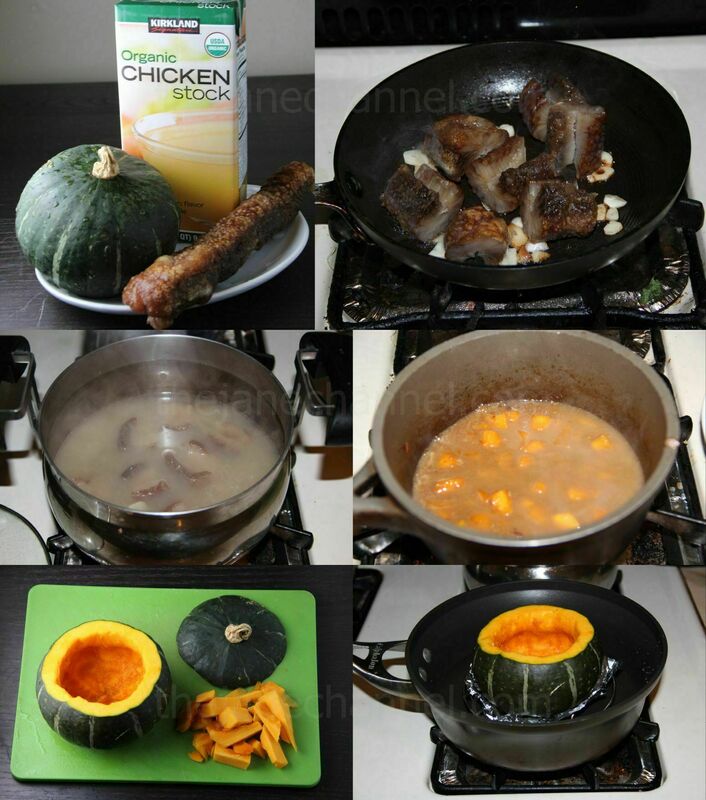 Before cooking this dish, I have never had pumpkin with sea cucumber before so I didn’t really know what to expect. They turn out to match very well – the fluffy texture of the pumpkin is a great accompaniment to the springiness of the sea cucumber. 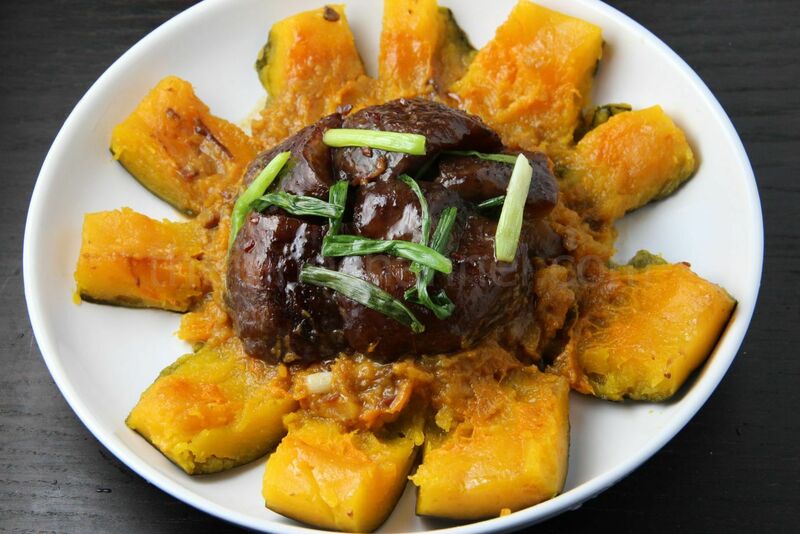 The pumpkin also has a natural sweet taste that nice balances the savoriness of the dish very well. Follow Sea Cucumber Cleaning Direction to prepare the cucumber or use pre-soaked sea cucumber. Set aside. Heat oil in pan. Add ginger and garlic and cook until fragrant. Add in sea cucumbers and stir fry for 3 minutes. Transfer the ingredients to a cooking pot. Add 1 tbsp oyster sauce, sugar, dried ham, and 3 cups of chicken stock (enough to cover the ingredients). Bring to a boil and reduce the heat to medium-low. Cover and simmer for 2.5 hours. Separate sea cucumber with the sauce and set aside. Cut top off the pumpkin and remove seeds and pulp. Extract some pumpkin meat and set aside. Place the pumpkin on a plate or aluminum foil and set the plate on top of a wide-mouth wok or large skillet as the base with a metal stand to balance. Make sure the water is about 1 inch beneath the plate. Cover and steam over boiling water for 20 minutes or until cooked. Do not overcook or the pumpkin will break apart. 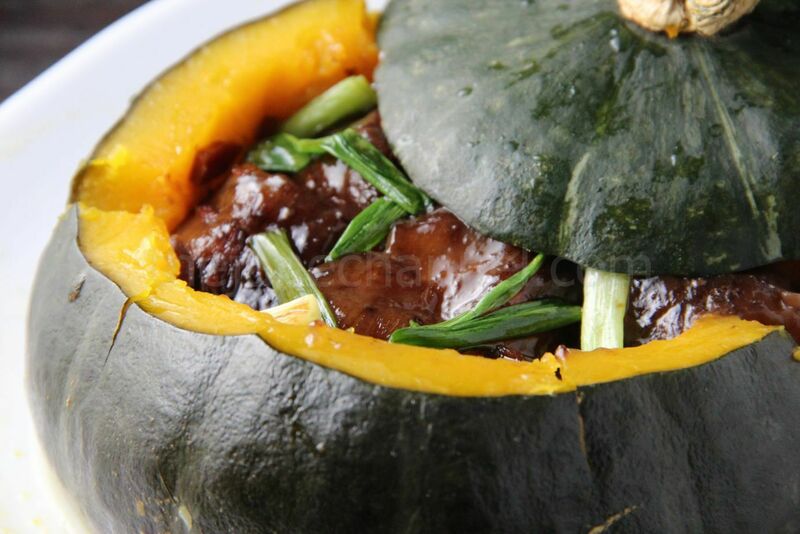 In a saucepan, cook the sea cucumber sauce with the pumpkin meat extracted earlier for 10 minutes or until softened. Fill the pumpkin with sea cucumber. Drizzle the pumpkin sauce on the side to serve.